There are so many Outer Banks restaurants vying for your attention upon arrival, but which ones should you visit? We thought long and hard about this and even reached out to some folks who’ve frequented this part of the coast. And with their help, we’ve come up with 13 places that you absolutely can’t miss! Keep reading for our mix of local haunts, visitors’ favorites, and more. These places to eat are just a part of your trip. Check out our jam-packed guide to a weekend in the Outer Banks! 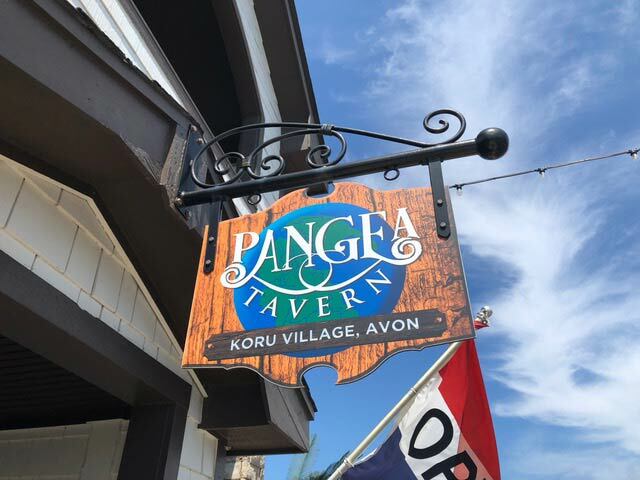 A delightful addition to Koru Village in Avon is Pangea Tavern. This gastropub features an outdoor beer garden, delicious innovative food choices, and an extensive selection of local craft beers on tap make this a must-visit while you’re relaxing in The Outer Banks. Also, this place is just steps from the beach and with the largest selection of craft beers on tap on Hatteras Island. Pangea Tavern is a favorite of locals and visitors alike. Honestly, my favorite dish is the Wonton Tuna Poke! That may be because I’m a huge poke lover. Regardless, this combination of crispy wontons topped with tuna poke, crabmeat, pico de gallo, scallions, jalapeños, and wasabi sour cream is an absolute delight for the taste buds! Heading to the lighthouse in Corolla? You are going to need some fuel for the climb. Look no further than the very appropriately named, Lighthouse Bagels! Tucked away in a strip mall, this hidden gem is worth a stop. You see, I grew up in New York and through no fault of my own, I am very picky about my bagels. If you’re like me, you know it when you see it and if you don’t know, rest assured that Lighthouse has it. The glossy sheen on the outside that lets you know you are going to have to work a little bit to get into it, but when you do, the inside is pillow soft and that yeast flavor comes bursting out, presenting itself as the perfect canvas for whatever you want to put on it. 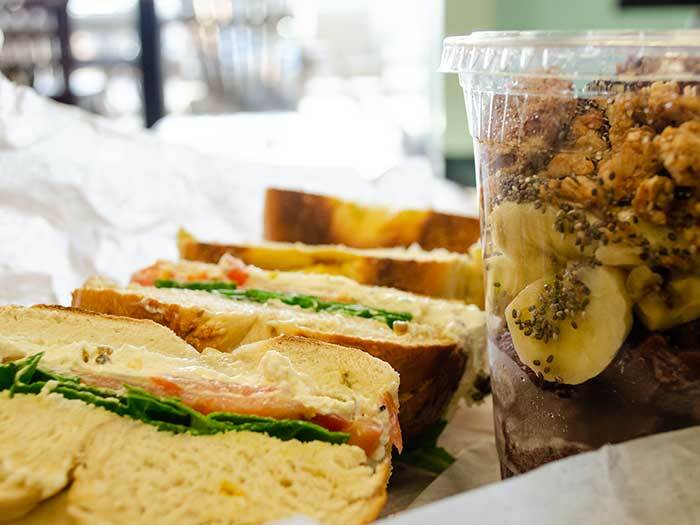 The folks at lighthouse bagels will do just that, starting your morning off right with cream cheese and lox or piling it high New York-style with deli ham and Swiss for lunch. Either way, you can’t go wrong. The Roadside Bar & Grill along the main road (Highway 12) in Duck is the type of place OBX visitors drive by (even for years) and wonder what it is like. It is understated, not flashy like other Outer Banks places, blends well into the scenery, and looks like a local hangout. 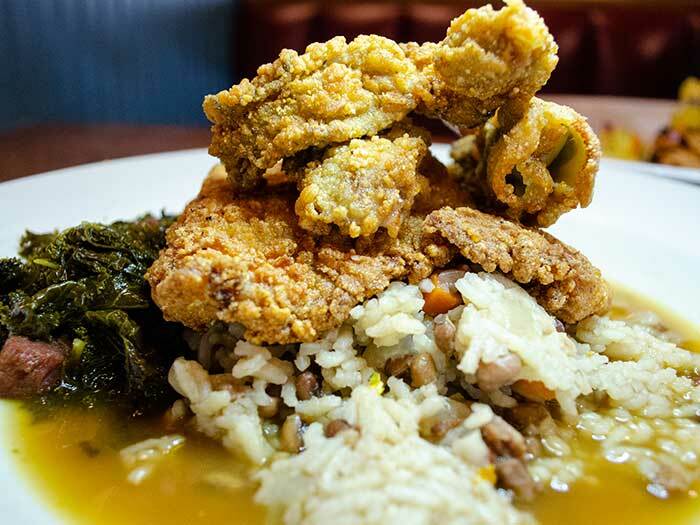 Roadside serves wicked fresh seafood dishes and potent drinks. Patrons can sit outside on the patio and listen to live music, inside at the quirky bar, in a huge booth with glass tabletops covering a myriad of seashells (my fave). Even though I have tried many dishes at Roadside, I seem to always order the scallops, to accompany the area’s best Dark & Stormy. 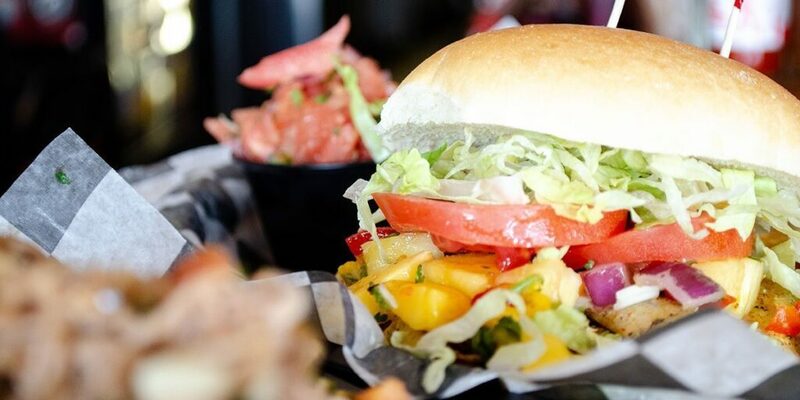 “Quality Food with Laid Back Vibes” isn’t all you’ll get from Food Dude’s Kitchen! At this small shop in Kill Devil Hills, you’ll also find a Caribbean-inspired menu fused with the delicious local seafood. All their dishes are packed with flavor. Jerk chicken, blackened fish, and the most mouthwatering nachos you’ll ever taste just a few of their signature menu items. And trust us, you’ll keep coming back. While you wait for a return trip, you can drool over their menu items and specials on FDK’s Instagram! 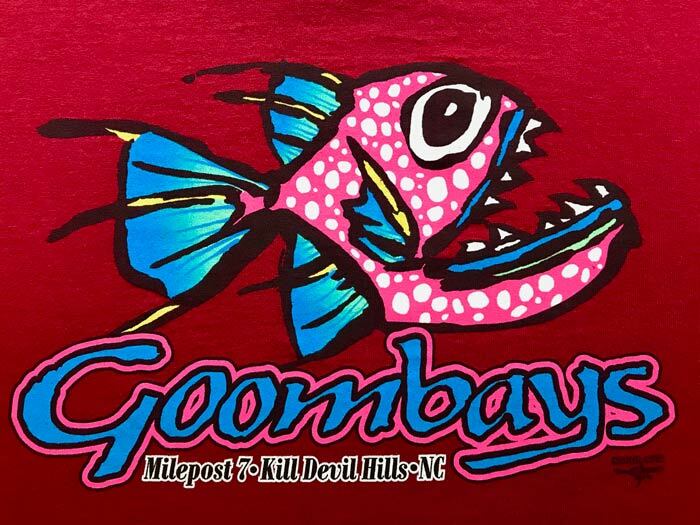 One of the most fun and family-friendly restaurants on The Outer Banks Ocean Road is Goombays in Kill Devil Hills. You can head to this casual spot straight from the beach for lunch or dinner. Look up at the ceiling and you’ll see turtles and jellyfish swimming and a surfboard passing overhead. A large colorful mural of fish and coral adds to the feeling that you’re dining “under da sea.” We love the Grilled Fish Plate and the Caribbean Kingston, featuring the local fresh catch. Wright Cottage Court in Kill Devil Hills was our home base during a recent trip to OBX. After a lovely time there, we include it among our favorite places to stay in North Carolina! When we originally posted this guide, we got a little bit of flack for leaving out Kill Devil Grill. It’s a key institution in the OBX food scene and we knew we had to rectify it on our next trip. This place’s interior takes on the classic American diner, mixed with random vintage décor. If you’re want to sum up the vibe inside, think punk rock meets the Happy Days. However, the food is what should really draw you there. Featuring fresh seafood, juicy burgers, and award-winning desserts, there was nothing that wasn’t absolutely delicious! And if you’re looking to visit on a specific day, be sure to check KDG’s Facebook page for their Chalkboard specials! Photo by Christina Riley, NC Tripping. 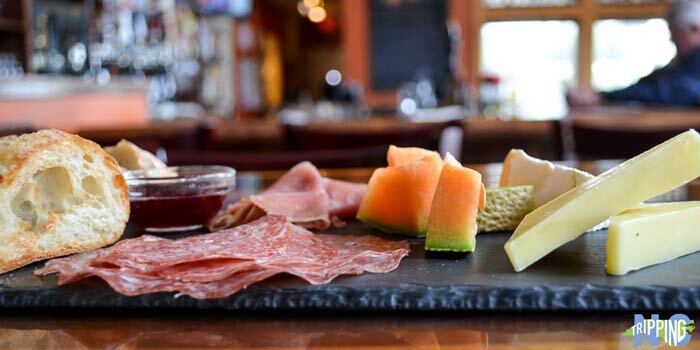 With hundreds of beer labels and thousands of wine bottles in-house, it’s almost easy to forget that OBX TRiO in Kitty Hawk serves up really delicious food to soak it all up. To top off the trifecta, you’ll find a great assortment of cheeses from all over the world. They perfectly pair with a baguette, soppressata, and the rest that makes up Trio’s European Breakfast, which you’ll find on their brunch menu. The fun continues through dinner, where you can choose from appetizers, large plates, and charcuterie to go along with more of that wonderful cheese. 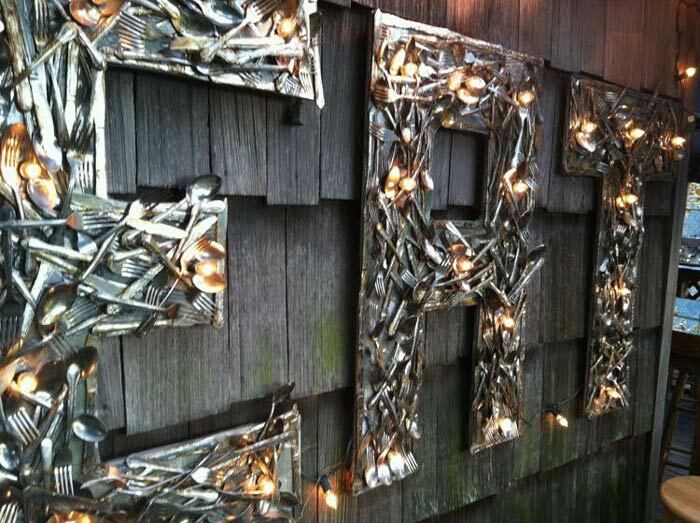 We also mentioned TRiO and other year-round restaurants in our off season guide to The Outer Banks! 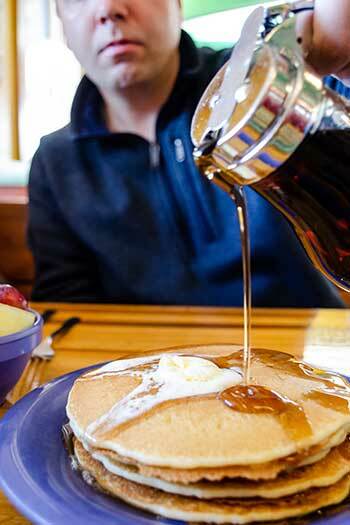 Filling tables and bellies since 1985, Stack’em High Pancakes and So Forth is the perfect breakfast spot for your stay in the Outer Banks. It’s served up cafeteria style, and you grab a tray like you did in elementary school. Choose grab-and-go items like fruit, muffins, or yogurt and then place your hot food order at the end. Known for their signature light and fluffy pancakes, Stack’em High Pancakes and So Forth also has scrumptious waffles and traditional eggs and meat sides. You can also take home some of the beach with their Original Pancake/Waffle Mix! Hey, you’re at the beach! You need a great beach dive, a seafood shack where the food’s hearty, the beer’s cold, and the fish is really fresh. 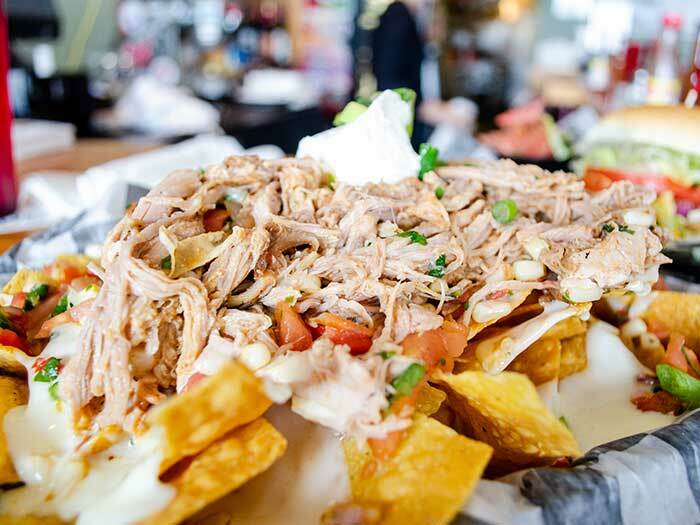 Layer on a Caribbean accent and you’ve got Tortugas’ Lie, a favorite right on the beach at Nags Head. The food will make you think you’re hearing a steel drum tinkle to a Reggae beat. That’s because of the blackened fish, jerk pork, coconut-crusted chicken that will arrive at your table. 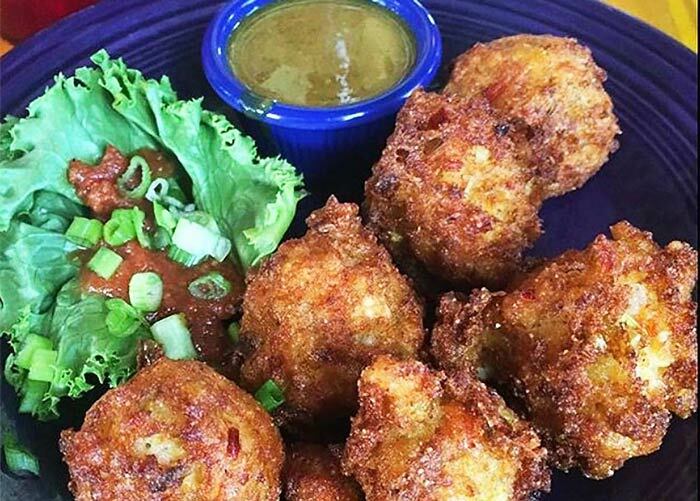 The Cayman Conch fritters (pictured, above), clam chowder, and lots of steamers—shrimp, clams, snow crab legs—are divine. Enjoy the uber-casual vibe, with a funky décor of license plates from around the country tacked onto the aqua-hued ceiling beams. Like any proper dive, it’s got a full and noisy bar. And ask any local up and down the Banks where to get the best pie and you get the same answer: Tortuga’s Lie. Tortuga’s Lie is not far from Outer Banks attractions Jennette’s Pier, Wright Brothers National Memorial, and Jockey’s Ridge State Park! We had to include two on Nags Head, mainly because of the awesome things happening at Waveriders Coffee, Deli, & Pub. Right off Croatan Highway and close to Bonnett Street Beach Access, this place is awesome. You just have to get in early because Waverider’s gets busy. Don’t worry, though, because you can join and enjoy their amazing food and drinks. You can also grab a board game and hang out with friends before and after eating. We just recommend you order either the Waverider (duh!) 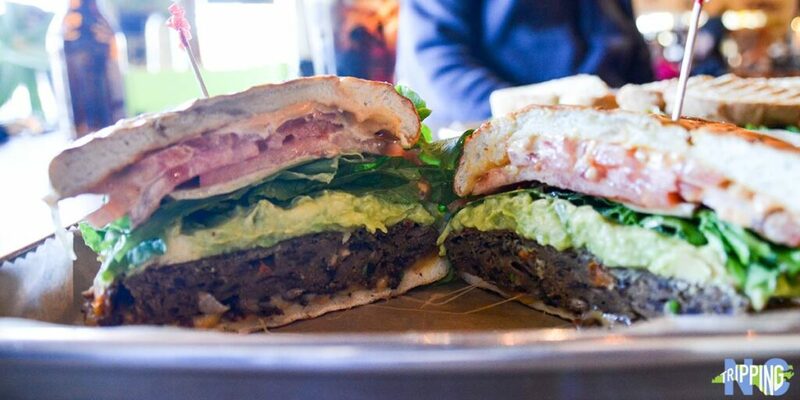 or the Black Bean Burger, which is one of the best light options you’ll find in The Outer Banks. Waveriders is a short drive away from Nags Head Woods, which ranks among the great fall hiking trails in North Carolina! One of the most striking things about Ocracoke is how relaxed it is. This no-fuss island has a lot of great restaurants to visit before or after you spend a day at the beach. Of all the memories we made during our stay, one of the most striking—and delicious—was enjoying seafood at Ocracoke Bar and Grille. The carefree, casual ambiance is prime for enjoying food from the coast. And the sun streaming into the bar area during “golden hour” brings together the harmony of every beloved thing about this area of The Outer Banks. I love that they have happy hour specials! We immediately ordered their clam box, which arrived in style in the top of a beer box container with red and white checked paper. All you need is napkins, some energy to break the meat of the clams out of their shell, and a cold beer to compliment it! Barrier Island Bagels in Southern Shores is without a doubt a labor of love. Run by an incredible couple, you can walk in and smell the waft of bacon and yeast from the morning’s work. I mark the quality of a bagel shop on whether or not they a) offer egg bagels and b) if they don’t look perfect. Having previously worked with Lighthouse Bagels in Currituck, Allison and Josh are now proofing their own bagels for the people of Dare County. Bonus: because they have kids, visitors to BIB will find an awesome kid section, for tired parents like us to sit and drink coffee while the little one plays! Conveniently located in Southern Shores, Coastal Provisions brings the freshest seafood from the ocean right on to your plate. This upscale gourmet market and wine bar serves lunch and dinner in their dining room, wine bar, and oyster bar. They also have a full-service butcher, seafood counter, specialty cheese, and chef-prepared foods. Coastal Provisions is the perfect place to stop for a glass of wine and oysters on the half shell. It’s also a great eat-in option, with great food to take home. 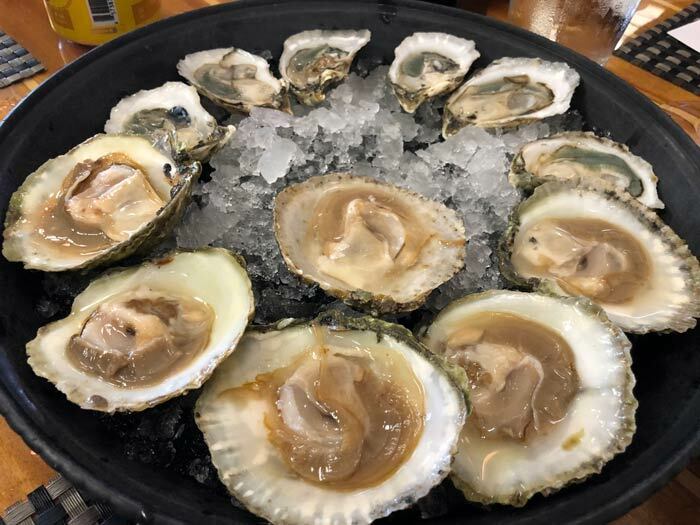 With at least ten different oysters to choose from daily and their award-winning crab cake sandwich, this is a place you must add to your list of can’t-miss Outer Banks seafood restaurants. 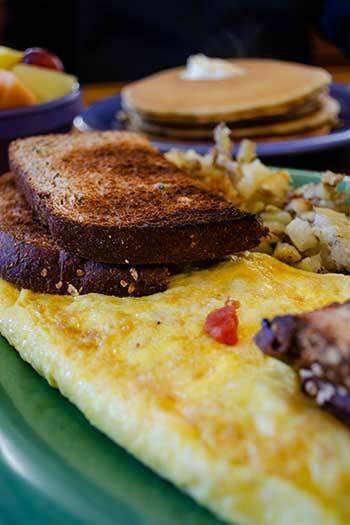 So are you hungry for more Outer Banks food? Ever been to any of these places? If not, which one would you like to visit first? If you’re still thinking of things to do beyond these awesome restaurants, check our Weekend travel guide. It includes eats, but also many things you’ll want to do and see during your Outer Banks vacation. Either way, we hope you enjoy your trip to The Outer Banks. We also look forward to hearing about how your vacation went. As always, feel free to let us know in the comments section below! This guide is part of our series on North Carolina Food, Things to do in The Outer Banks, and Places to Visit on the North Carolina Coast. It was originally created on September 16, 2018. It has been maintained and updated (as of April 5, 2019) to reflect current viewpoints and travel trends. Special thanks to those who contributed their words and images to this article. Please go check out their awesome work…after reading this, of course! This entry was posted in Travel and tagged Avon, Corolla, Duck, Food, Kill Devil Hills, Kitty Hawk, Nags Head, Ocracoke, Southern Shores, The Coast, The Outer Banks. Great round-up of OBX restaurants. You’ve got some of my favorites here and a bunch of new ones I need to try. Good thing I’ll be on the Outer Banks in October! Thank you, Julie. Hope you have fun exploring OBX. We love it and can’t wait to go back! Wow, awesome! I think we need to go back just to hang in Kitty Hawk, huh? Thanks so much, Steve! Hello Carl: You missed the absolute best one in Kill Devil Hills – The Kill Devil Grill!!!!!!!!!!!!!!!!!! Whoops! Thanks for stopping by and for pointing that out. Can’t hit them all, I guess! Really! How can you miss the Kill Devil Grill? It is my personal favorite! Lunch and dinner is awesome! I’ve Got Your Crabs has the best fresh local seafood on the beach! Locals favorite! Loved that place! It was one of our first places to eat a couple of years ago. Kicking myself for leaving it out! Colington Cafe…and Saltbox Cafe should not be missed either. Looks like a couple of nice additions to our “OBX Misses” that are growing by the day. Really appreciate you pointing those two out, though. Always good to hear from other folks about what food in the Outer Banks that they love. Cheers. Love Tortugas Lie! We come from Huntsville Alabama every year for vaca to The Outer Banks. We always make several trips for the great local food and wonderful service at Tortugas Loe. Thank you, Connie! It’s a great place. Hope you can keep making it to OBX each year! OBX has so many great places to eat. I provided one of my favorites but, dang, there are plenty more. Happy eating! Loved your contribution, Charles. Thanks for offering it up. Looking forward to exploring more places to eat in OBX in coming years, but this is a nice start, huh? Thanks! I would add Ocean Boulevard Restaurant in Kitty Hawk. And they take reservation. I love their open kitchen and chef prepared foods! Hi Reverend, thanks for stopping by! Might have to make an appearance there and add to our list. Buxton Munch is The Best!!! I can’t believe it’s not on this list!! Wow, thanks for mentioning Buxton Munch, Kim! Guess we’ll have to swing back down there in have a bite!